Notes: This one started out great, but got bitter after a while. Initially, I was impressed with the notes of vanilla and honey, but this proved to be short-lived. Notes: Nice sherry influence with hazelnut and oak notes. Notes: Much better than BenRiach 12 with more sherry influence. Also, better than MacAllan 12 (from a recent tasting). This one spends 7 years in ex-bourbon casks, then 5-6 years in sherry casks. It’s blended from malts up to 16 years old (an artifact of the distillery closure from 96-’02), with the youngest being 12 years old. I highly recommend this one for MacAllan 12 fans… it’s better and costs less. Notes: Starts out in ex-bourbon casks, then finished for 18 months in American oak. Sweet and fruity. Notes: Milder nose, but really great taste. It’s aged in first-fill Oloroso Sherry casks for the entire 15 years. Easily, the standout of the night. I want some! Notes: Not as good as Revival… less dark fruit and more spice and wood. Notes: Finished in Tawny Port casks and heavily peated. Not available in USA. Spicy, hot, peaty and sweet. Very good! I might have to search this one out on future European travels. 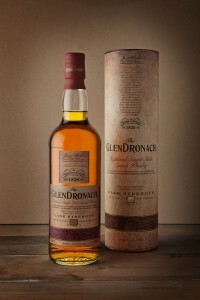 I’m now a big fan of the BenRiach and Glendronach distilleries. This was a great lineup of whisky, providing great variety and interesting (even creative) combinations of aging. 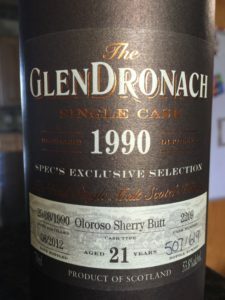 I’ve got a bottle of Glendronach 21 Year Old Single Cask Oloroso Sherry Cask (1990) that is bottled at cask strength and is non-chill filtered at home that I can’t wait to try now. Posted in Whiskey. Tagged BenRiach, Glendronach, Single Malt, Speyside.